Nazz were not really Todd Rundgren's first band, both he and Van Osten had earlier played with Woody's Truck Stop, who were basically a white blues band and went on to record an album in the early seventies. 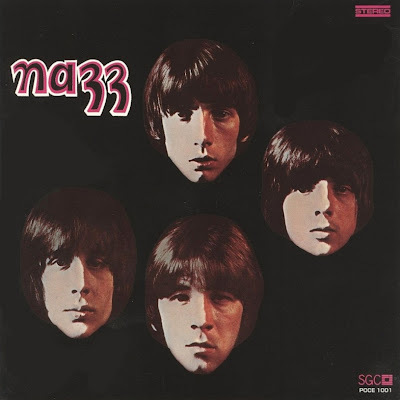 Essentially a British-influenced mod band, the Philadelphia-based Nazz were quickly signed by Screen Gems Columbia who were looking for a replacement for The Monkees. 1968 saw the release of their debut album and a single Open My Eyes. Both were superb. The single was a high energy rocker with a compulsive beginning (which begged comparison to The Who's I Can't Explain), and beautifully blended harmonies. It received a lot of airplay in Britain, but inexplicably was not a hit. In the U.S. it was only a minor hit. It may well have been a much bigger hit, but many stations preferred to play its Rip side Hello It's Me, which was also a minor hit when re-issued as the 'A' side to Crowded in 1969. The album was full of variety - aside from the stunning Open My Eyes, it contained a number of fine rock ballads such as See What You Can Be, Hello Its Me, and If That's The Way You Feel and other dynamic hard rock numbers such as Back Of Your Mind, When I Get My Plane and She's Goin' Down (the latter showing a distinct Hendrix influence). Despite its acclaim, in retrospect, as a superb album Nazz did not sell, either in the U.S. or the UK. Released at the height of the American West Coast's heyday, perhaps it cut across the general musical tide that year. However, it became a sought after collectors' item.